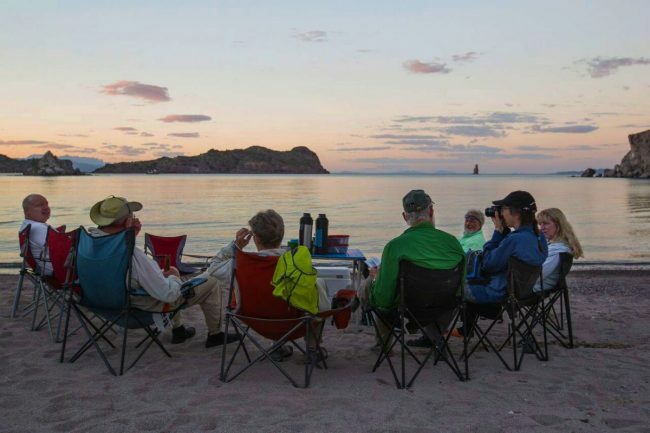 For over 35 years, Sea Trek has been leading trips on the Sea of Cortez from our home base in Loreto, California with adventurers like you. 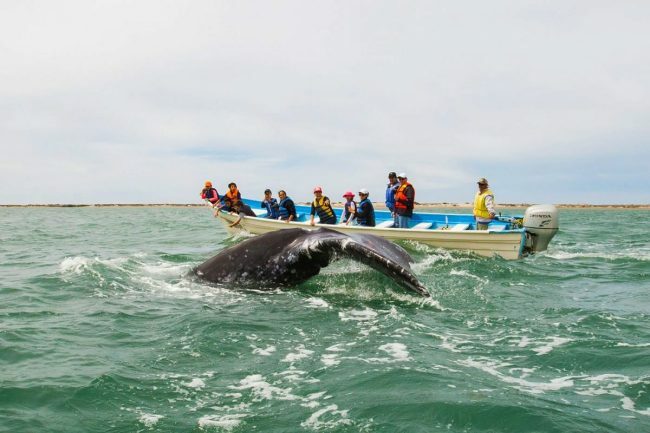 We offer a variety of Baja tours, from relaxing, boat-supported vacations to challenging, expedition style adventures. Trips last 1-2 weeks, and run from late October through April. The peak of our season is February, March and April. During these times of year, the water is warm, the weather mild, and the sunsets unforgettable. 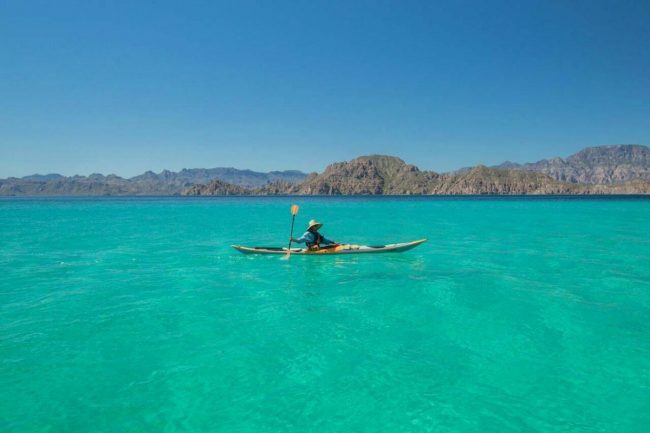 The Sea of Cortez is a breathtaking sight, with the southeastern landscape of Baja California Sur running into the bright blue ocean. The desert ridges and canyons around Loreto boast the richest variety of life on the peninsula, and the nearby islands and reefs teem with life. From the Sierra de la Giganta mountain range to the idyllic coastline, Baja California Sur is a natural paradise for adventurous travelers. Your Sea Trek expedition will let you do as many of these as possible. 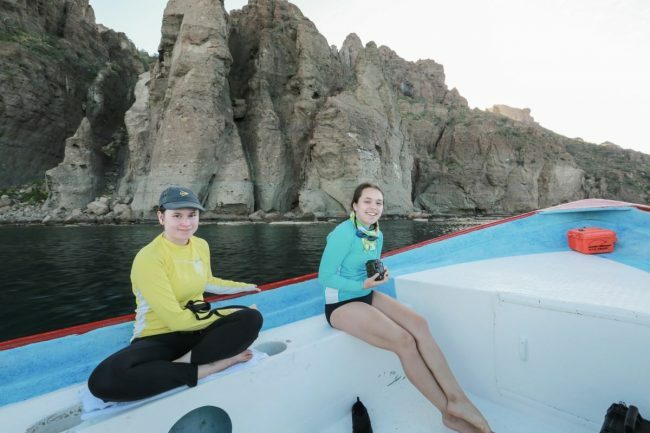 From paddling or snorkeling through the crystalline waters to hiking in the mountains and camping in isolated coves or the shores of uninhabited islands, we can help you experience the whole range of adventures that Baja Sur provides! Better still, you will be in the company of some of the most knowledgeable and experienced guides around. 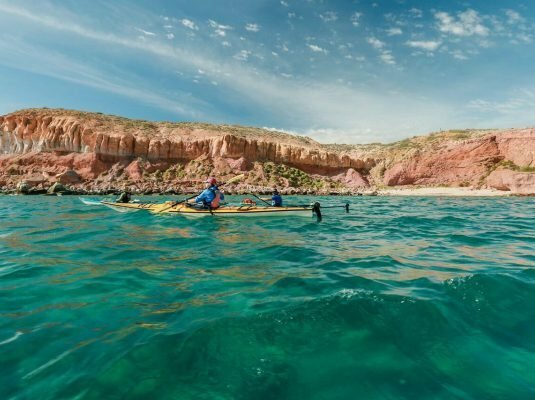 Many of our guides grew up in the area, they have maintained connections with locals all along the coast, and they can tell you more about the natural and cultural history of Baja California than you ever knew. Others are skilled instructors, coming down after a season of teaching and guiding in Northern California. You will not find a more inclusive or more talented group of guides. Adventure is right around the corner! Check out Sea Trek’s Baja trips and reserve a spot to get yours started today. We look forward to getting to know you. 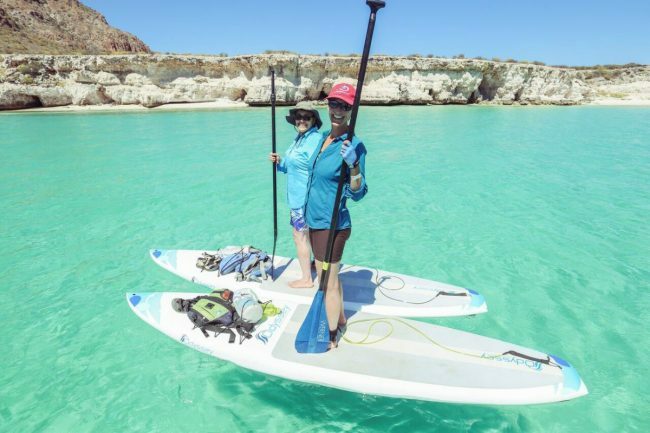 Some of our trips are operated by Paddling South and Loreto Kayak Tours. They have been in business safely leading thousands of clients since the late 70’s. The Paddling South trips are primarily expedition style, meaning there is no Panga support boat. All of your gear is packed into the boats daily. It is an amazing way to travel the remote islands and coastlines of the Baja Peninsula. Sea Trek bought the sales side of Paddling South in October of 2015. 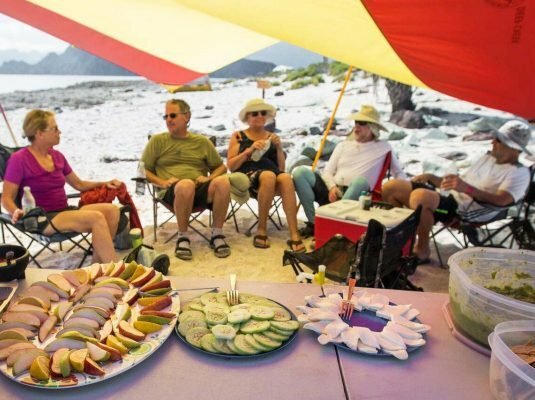 We felt their expeditions were a great way to round out our Baja offerings. The Paddling South guides are the best in the business and we know you will love your time with them. Custom Baja trip for you and your family and friends. Kayak or Stand Up Paddling. Expedition Style or Skiff Supported. Steve has been guiding, developing programs, and managing for Sea Trek for over 25 years. He has enjoyed paddling in Chile, Alaska, Belize, Guatemala, Honduras, Ireland, Wales, BC, and Baja. Steve has been our Baja Program director for 15 years now. 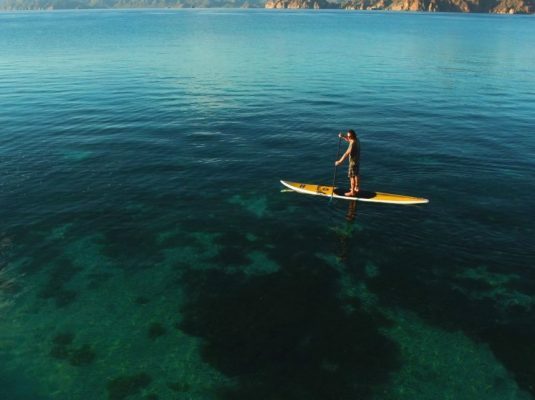 With the advent of SUP, Steve has been focused on developing exciting inter-island adventures via paddle boards, on our traditional kayaking routes down in Baja. He is fully committed to “downwind” paddling during the tempestuous “el Norte” blows we see in the mid-winter on the Sea of Cortez, and enjoys free diving and sharing the many secrets of the unforgettable desert and marine environment of this unique and memorable part of Mexico on the calmer days. 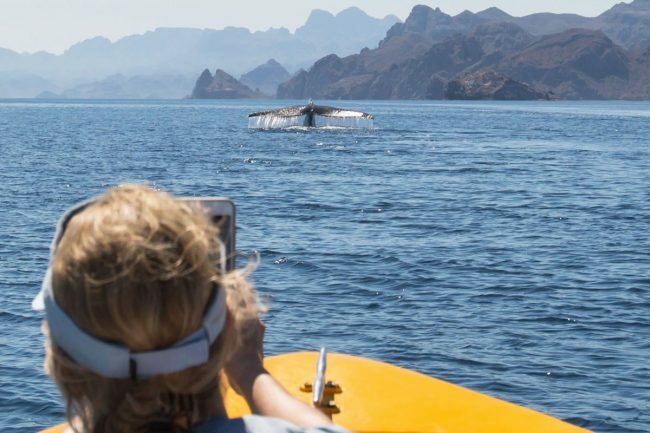 He will usually be the first person you see when you step of the plane down in Loreto for our Baja tours, and if he shows up in your camp later in the week, you can be sure he will likely have something fresh and delicious from the sea to deliver! Juve is from the village of Puerto San Carlos, which is on the Pacific side of Baja on Magdalena Bay. Growing up in a small fishing town you learn the all there is to know about the marine environment. You become an expert on the habits of fish that you depend on for your livelihood and the habits of the migrating Grey whales that arrive every year in the lagoon outside your front door.He is certified as a Master PADI diver and an expert on the identification and habits of the Blue, Humpback, Fins and the other whales that inhabit the Sea of Cortez. 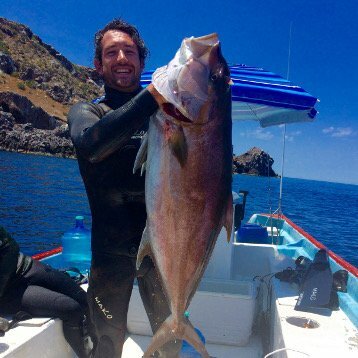 Having been trained in survival methods in the Mexican Marines he knows how to live in the desert.Since 2007 he has been Sea Trek’s lead guide in Loreto. Juve loves taking the lessons he’s learned from the ocean, and adventures from surviving in the desert and teaching them to the guest on his trips. Its entirely possible that by the end of a trip with Juve you’ll be catching fish with your hands and opening beers with rocks. Art Noll is an avid cyclist, mad mechanic, world traveler and attempted poet. Art spends his free time free-diving, tinkering or dreaming up his next big trip, be it bicycle touring, hiking in the Sierra Nevadas or threading a roadster through New Zealand mountain passes. His favorite paddling experiences include Baja, Thailand, The Mighty Mississippi and Backwater Bayous of SW Florida. Art defines a good day as one in which he spends more time in the water than on land. Jose lives in Loreto with his wife Nina and children Jose Jr., Jessica and Chuyita. He has been a commercial fisherman in Loreto with his brother Alphonso. 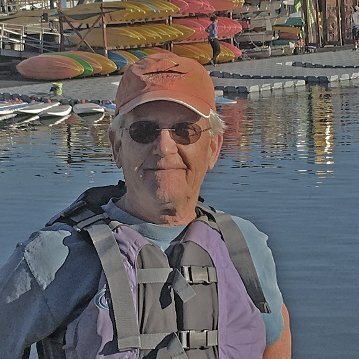 For four summers he worked at our base in Sausalito guiding trips, driving the Sea Trek skiff, doing boat maintenance and improving his English. His family, including six brothers has lived in Loreto for many generations and he is our second family during our Baja season. Geracimo (Coco) Murillo is another one of our support boat captains. He has lived in the small fishing village of Ligui, near the islands all his life. He knows these waters very very well. He is an expert boat captain, fisherman, and camp chef (not to mention a really nice person).Coco’s the one to see for those early morning fishing trips. Afterwards you can join him (and the seagulls) for a fascinating lesson on how to clean your catch. You’ll be in great hands with Coco as your captain!! Gray grew up on the waters of the San Francisco Bay and Pacific Ocean. Competing at a national level for Sailing allowed Gray to gain an in-depth knowledge of the Bays winds and currents. His free time is now spent surfing, fishing, diving, and paddle boarding these waters. After earning a degree in Environmental studies Gray moved to Indonesia for three years, working as a green building consultant and project manager. 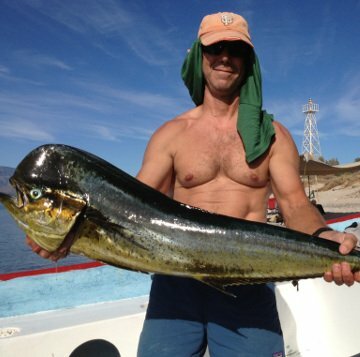 He has spent the last four seasons living in Baja, Mexico working for Sea Trek as a guide and cook. In 2015 Gray went to Antarctica with Quark Expeditions to build and guide the first paddleboard program in the Antarctic Peninsula, and is now beginning his third season there. When home in the Bay Area, He guides day trips and teaches lessons with Sea Trek and OnBoardSUP. Gray has spent much of his free time over the past 8 years finding new ways to use paddleboards such as hunting, fishing, diving, and multiday day self supported trips. Gray is a nationally certified EMT, trained in Wilderness First Aid, PSUPA (Professional Stand-Up Paddle Association) Instructor Trainer, as well as holds a STCW -95, and California Boating License. Bob has been part of the Seatrek family for over 25 years. He was born in San Francisco and raised in Marin. He caught the kayaking ‘bug’ in the late 80’s after doing one of our Baja expeditions. Following his retirement 10 years ago from a career in banking, he became a guide for us. 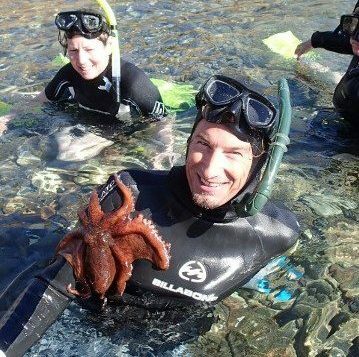 You will find him leading trips from Sausalito, Tomales Bay and one of his favorite places on the planet, Baja California. He has traveled extensively. At last count, he had visited over 100 countries and managed to kayak on every continent including Antarctica. When not traveling, Bob splits his time between his homes in Marin and Truckee, California. Leigh founded OnBoardSUP Yoga in 2009. She has been teaching here in Richardson Bay since then. 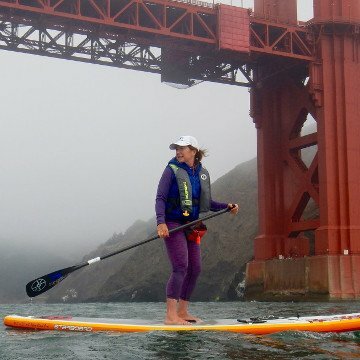 She is a founding member, Instructor Trainer and Advisor for The Professional Stand Up Paddle Association and has Stand Up Paddle Master Certificates with the PSUPA, US Coast Guard and WSUPA (World Stand Up Paddle Association). 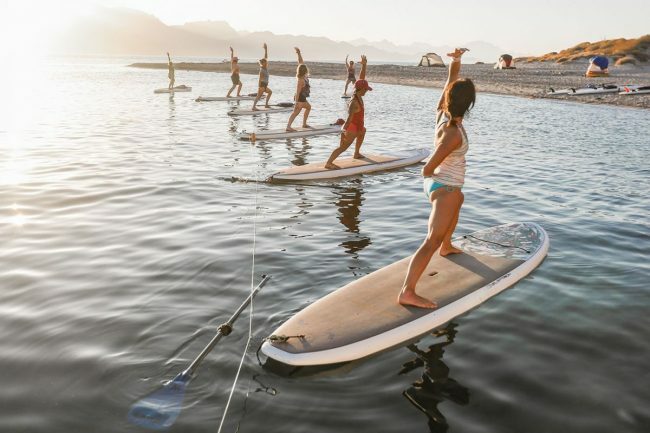 In addition to teaching Yoga, Pilates and Fitness classes on the boards, Leigh is a guide for Sea Trek, and teaches SUP Certifications, lessons, clinics and leads at least two Sea Trek Baja Retreats annually. OnBoardSUP.com. 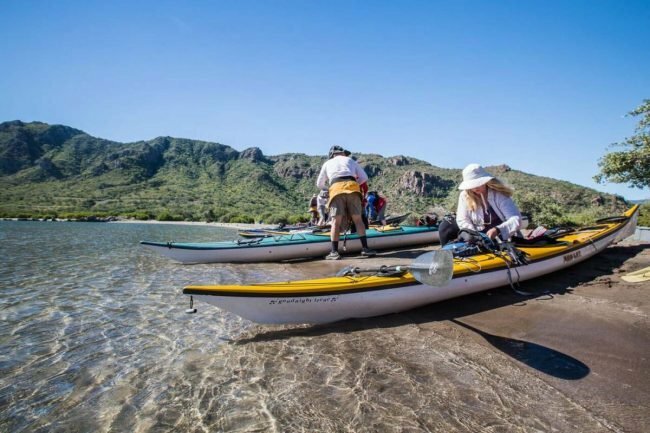 Jorge Salas,…raised in Loreto… is lead guide, and a partner in our local outfitting company, Loreto Kayak Tours. In 1997 he graduated from R.A.R.E., a natural history training institute, and went on to receive a Baja Guide Scholarship from the National Outdoor Leadership School (NOLS). 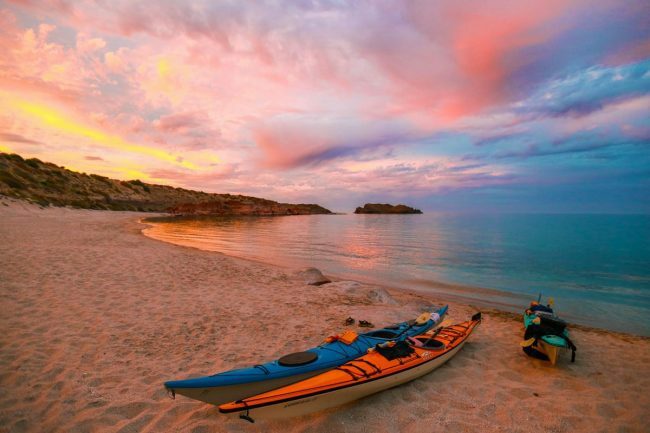 In the Loreto branch of our state university he trains Alternative Tourism students in sea kayaking, hiking, mountain biking, birding and Leave No Trace concepts. He is highly trained in all aspects of trip leadership. Jorge’s professional and friendly attitude always keeps us smiling. Antonio Hernandez, … a local, born and raised in Loreto is one of our head guides, and also a partner in our local outfitting company since 2007. Excelling in sports and studying sports-education he has transferred his skills to the coast and mountains of his hometown and now works as leader on most all of our tours. Many of our guests who have paddled with ‘Toño’ request him as guide on their return tours. Antonio’s enthusiasm is inspiring, his sense of humor, infectious, and… encourage him to sing a bit… you’ll be back too! How much is the plane ticket? From Los Angeles a plane ticket is approximately $450-$750 round trip. Add approximately $150 for the additional cost from San Francisco. 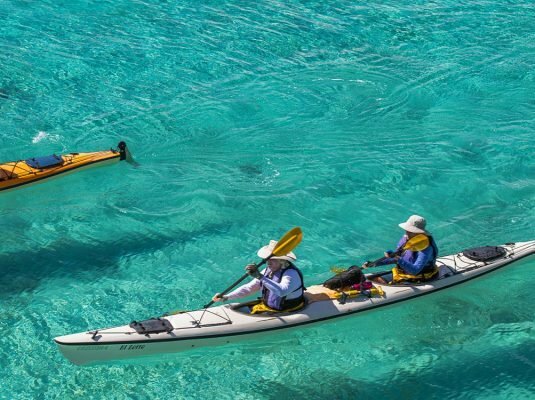 I’ve never kayaked before – can I do this trip? This trip is fine for beginners. Our guides are experienced kayak instructors in the off season, and they will enjoy teaching and sharing with you all of the skills and safety techniques that you will need and want to know. Many clients tell us that the time spent with them in the afternoons often is the richest part of their trip, with many folks advancing several levels during the course of their week with us! That said, participants should be in reasonable physical shape and be ready to paddle for multiple (2-3) hours each day. More importantly, you should enjoy the experience of camping and “roughing it” outdoors. 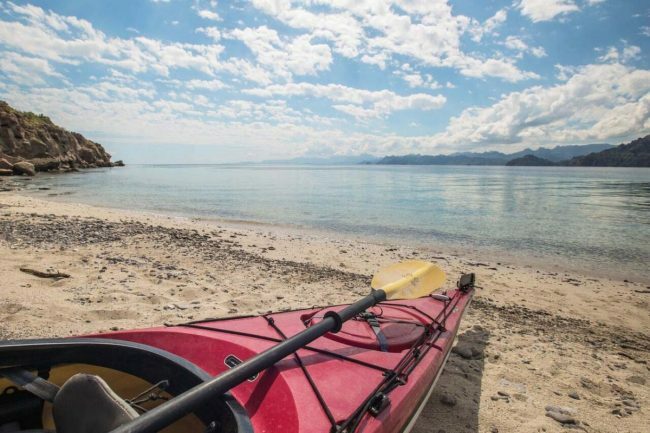 Signing up for a Baja trip lets you take our Intro to Sea Kayaking Class in Sausalito for half price. How much do we paddle each day? This varies depending on the trip. On the Classic Islands or Whale watching trips our longest stretch is approximately 6-7 miles when we move camp. Family Base Camp we paddle and use the panga depending on the age and energy level of the kids. The mileage listed is when we move as a group. Often afternoons are free for those who want more paddling time or you are welcome to take a boat out early and greet the sunrise. It’s the best seat in the house! Baja is mostly sunny and the temperature is generally in the 70-80s during the day. At night it can cool down into the 50s in February and early March. We offer trips October through early May. Can I drink the water in Baja? Loreto has a water treatment facility and the town’s water is drinkable, but to be extra safe, we recommend drinking bottled water when in town. Our hotel provides bottled water. Water provided on the kayak trip comes directly from a water purification plant. Delicious and healthy backcountry cuisine is our specialty, and clients are consistently amazed by the variety and quality of our meals. 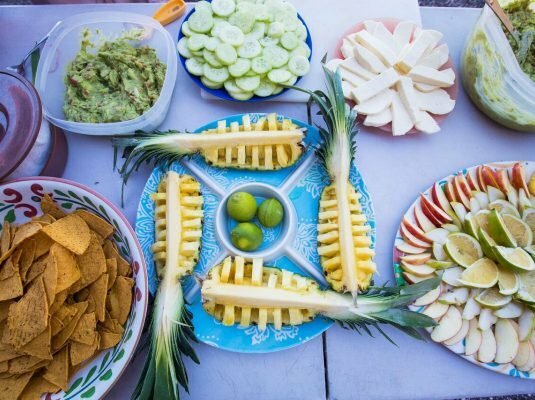 After hors d’oeuvres and a cold beverage for happy hour, you will be treated nightly to original Mexican platters, seafood, local vegetables and fruits, and dessert. A nice hot drink like coffee and Kahlua (or perhaps herbal tea) is perfect for watching the nightly star show! Breakfasts and lunches are likewise healthy and tasty, with local fare alongside familiar foods from the States. If you ever want a snack, energy bars, fruit juices, cold mineral waters, and local nuts and fruits are always on hand. Of course, the local tortillas, fresh handmade ceviche, and guacamole and chips with a Pacifico chaser are the most requested items on any trip, and you will never forget them! Vegetarian and gluten free diets can be accommodated, with delicious and fulfilling meals for you at every turn being our goal and mission. Do I need to bring my own camping gear? Sea Trek is pleased to provide high quality roomy Marmot brand tents, wetsuits, snorkeling gear, and dry bags. 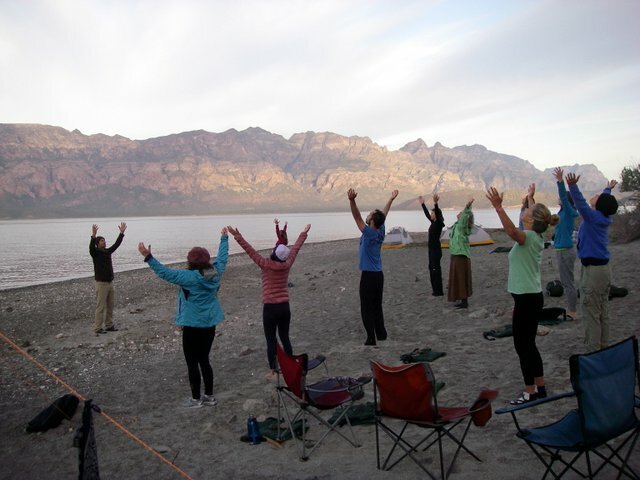 If it is your goal to travel to Loreto with “Carry On” only to eliminate any luggage or connection delays, we also offer rentals for sleeping pads and bags. You only need bring your clothing and personal items. We provide you with a detailed packing list upon receipt of your trip deposit. We are proud of our beautiful fleet of kayaks, which come in both fiberglass and Kevlar, single and tandem. You can choose what type of boat you want, or we can assign you one based on your experience level. This is Baja, so a few changes of beach wear, some warmer extra layers for evenings and early mornings, some town clothes, and a sun protective long sleeve shirt and pant are all that you will need in the clothing department. For footwear, you will want water oriented sport sandals or booties that protect the bottom and sides of your feet for paddling, tide pooling and general water time. A light pair of walking or running type shoe is very good to have for your non water time on the islands. Heavier hiking shoes are overkill for the terrain we encounter on our route. A shade hat is indispensable, along with a visor or baseball type hat for wearing while paddling on breezier days. Most folks enjoy the cultural interaction of going out in town on their first afternoon in Loreto and purchasing one of the beautiful and inexpensive handmade straw sombreros. We’ll send you a thorough clothing and personal item list when you sign up. What is the bathing situation? Our standard protocol is to wash off in the sea with a biodegradable salt water soap such as Camp Suds, which leaves no salty sticky feeling afterwards. We bring a large amount of purified drinking water along. You’re welcome to use some of this in your water bottle to give your face a fresh water rinse off. There are always two sanitary hand washing stations in separate locations in camp for maintaining general hygiene, cleanliness and personal comfort. What is the toilet setup on these trips? Every year our clients compliment us on the comfort, vistas and ingenuity associated with our toilet arrangements. We are proud to be camping in a pristine wilderness environment, on islands with almost no permanent structures of any kind. We remove all wastes that we generate, and leave no footprint or impact for those that follow us. The panga carries our portable toilet system. Our staff sets up the bathroom in a designated site that is private and we have a system for communicating when it is occupied or available. The toilets are emptied and cleaned frequently, and there is a sanitary hand washing station nearby with disinfectant soap that everyone uses. Plenty of toilet paper is provided. We reserve all our campsites in advance with the National Park so they are exclusively ours for the time we are there. They are all beautiful and remote with plenty of flat space for tents. They all have excellent waterfront views, with stunning snorkeling right in front of each spot. If you would like to express your appreciation to the guides through a gratuity, please know that such recognition would be enthusiastically received. The industry standard for tipping is approximately 10-15 percent of the trip cost. All tips received will be collected and equally disbursed amongst your guides by the trip leader.